The new home of “Firing Pin Shooting Sports” at 2195 1st Ave. is now open for business. 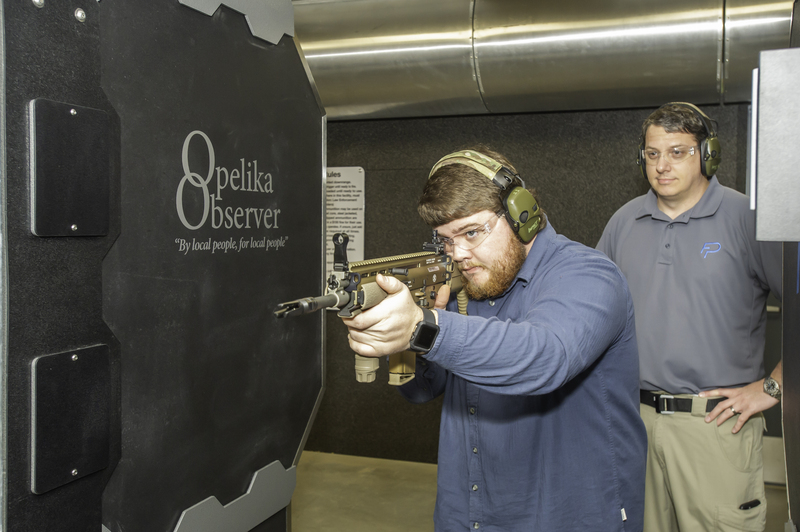 Previously located at 3900 Pepperell Parkway, the Firing Pin’s new space features a 12-lane indoor shooting range and classroom for gun safety courses, two of several new exciting developments for the business according to owner Charlie Edwards. “We’re definitely going to beef up on accessories, apparel and range essentials, stuff like ear and eye protection, range bags and more to accommodate our range customers. There will also be a boost in the handgun selection, (increasing it) by 15 to 18 percent,” Edwards said. The idea of having an indoor shooting range has been one of Edwards’s goals since opening in November 2011. Divided into two bays, the range contains six lanes for handguns and six lanes for rifles or other, more powerful weaponry. Before checking into the range, patrons will be able to secure a wide variety of firearm rentals, including pistols, rifles or a .50 caliber Browning machine gun. Use of the range is $22/hour for non-members, so Edwards encourages those interested to look into memberships for more cost-effective options, which are listed online at www.firingpinshootingsports.com. A ribbon-cutting ceremony and grand-opening celebration with the Opelika Chamber of Commerce are planned for an unannounced date in March. Firing Pin’s hours of operation are 10 a.m. – 8 p.m. on Mondays – Thursdays 10 a.m. – 10 p.m. on Fridays and Saturdays and noon – 6 p.m. on Sundays. For more information, call 334-737-6444, like and follow their social media pages or visit their website.